On Friday 6th May, 5 am GMT our servers were hit with an extremely heavy DDoS attack. 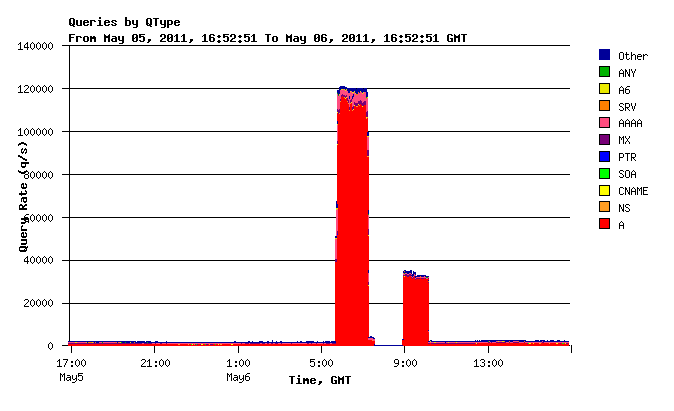 We were getting about 120,000 queries per second on each of our servers (about 40 times the usual peak load). Snapshot of the increased traffic we received An early investigation revealed that the attack originated from China and we immediately placed our IPs under TMS guard (it filters the incoming malicious traffic, and lets the genuine traffic through, although it is prone to false positives). The TMS guard started blocking all the traffic from China. We tried returning the servers back to normal at 10 am GMT but found that we were still receiving abnormally large traffic. To mitigate this we had to leave our DNS IPs in the TMS guard for the entire weekend. In fact, the attack has still not completely subsided but we have been able to restrict it to a manageable state where all services remain unaffected. I am extremely sorry for the inconvenience caused to all our resellers and their customers. I can assure you that we are taking every possible step to ensure that our system is not affected by such malicious attacks.